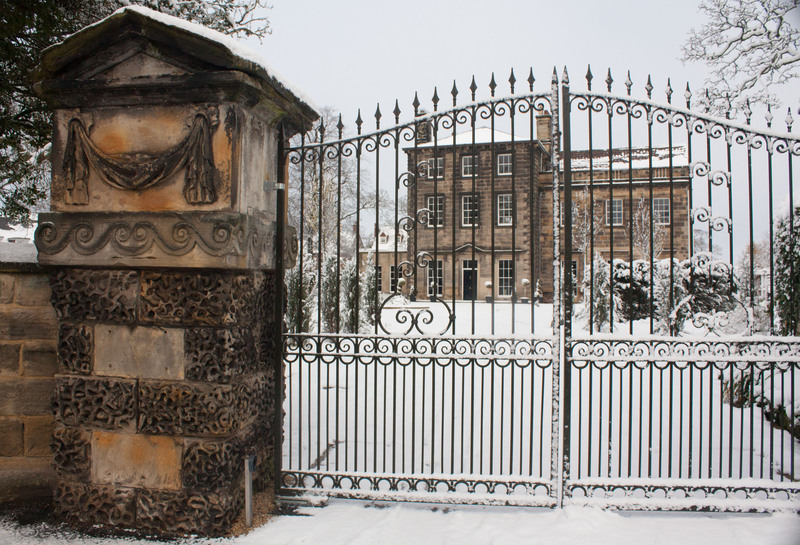 This picture on the right shows the manor under snow in March 2011. Stokesley Manor dates back to Domesday Book (1086) but no part of the original manor house survives, and there is little documentary evidence from which its history can be pieced together. As it survives today, the Manor although one edifice falls into two distinct parts and is aligned roughly north-south. To the north is a three-bayed, three storey section often referred to in the past as the Italian Wing while to the south is a two storey building of three (surviving) bays. The north section is clearly later in date. The stonework is uniform in appearance and the corners are embellished with decorative quoins. There are dentilled eaves and the wing is roofed in one hipped span. There are moulded surrounds to all the windows and on the front elevation, over those of the ground floor and central door, there runs a horizontal decorative moulding which incorporates a central triangular pediment. Examination of the roof space reveals timbers of generous proportions which form a roof of king-post design, aligned front to back. Carpenter’s marks are visible on some timbers and some of the trusses are strengthened by iron strapping which is bolted right through the king-post and the principal rafters. Substantial purlins run along each side of the roof. The roof space has been modified to provide living space, and in places on the exposed timber framing mortises are visible both on the rafters and on the kingposts where there were once wooden braces. The roof is a very fine though relatively late example of its type. It is apparently constructed from softwood and is probably dateable to the late eighteenth or early nineteenth century. The southern part of the Manor is clearly more ancient. On the exterior, there are deep mouldings (architraves) to the window casings and much of stonework is characterised by herring bone tooling. This, coupled with the decorative balustrade which survives above eaves level, would tend to indicate an early eighteenth century date. The roof space here, also converted into living areas, is totally different from that at the north end. The roof is constructed in two parallel sections, with separate north-south ridged roofs separated by a central ‘valley’. Heavy purlins run along each pitch linking the rafters. The roof timbers in this part of the manor are apparently of hardwood (probably oak) and instead of being of king-post design there appear to be collars at/above the present ceiling to connect the principal rafters. The rafters descend to the tops of the walls where they probably end in birdsmouth joints (see http://en.wikipedia.org/wiki/Birdsmouth_joint) which rest on wooden plates. These however are not at present visible. Had this part of the house been any later than about 1750, a single pitched roof would almost certainly have spanned the entire depth of the building, rather than using the twin ridge design which was adopted by the builders. Architecture and timbers therefore agree in indicating an early eighteenth century date (probably 1720-1740) for this portion of the manor. 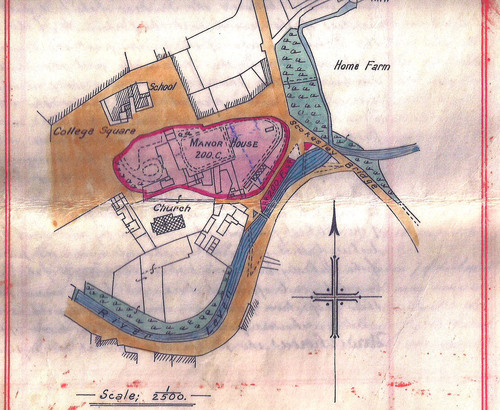 The picture on the left shows the manor as it was in the early twentieth century. The seven bays of the older section and the porch in the centre of this wing are clearly visible. Barry Harrison has said that this photo is most interesting, particularly the pair of chimneys either side of the front door area. This a very unusual position, but can be paralleled at a few small manor houses and large yeoman houses in the area e.g. at Hartburn (Stockton), at Great Ayton and as far afield as Brompton (Northallerton). Obviously, up to the fairly recent past, the manor house was an extremely imposing structure. Shortly after the end of the Second World War, however, it came into the possession of Thomas (Totty) Alderson, who embarked on major alterations. The older portion of the manor was shortened from seven bays to only three, and the porched doorway was moved to occupy the middle of the three remaining bays. Even more recently, the porch has been removed entirely, though the stonework of this bay bears clear traces of its former position. To the right is a plan of the Manor House and grounds made around 1920 when the property was sold to Mrs Anne Gatenby Gjers.2 The red outline shows the high stone wall surrounding the grounds, and it is interesting to note that the entrance gates were then on the north side, opening on to College Square. This must testify to a time when traffic was far less of a problem! 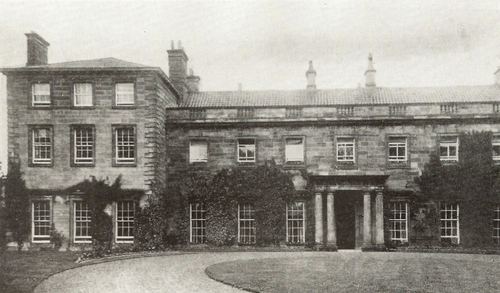 The Manor House itself extends north and south as far as the boundary walls, and the gardens extend as far east as the present Stokesley Motors. Even in its diminished state, the Manor House still stands out as probably the most architecturally significant building in the town, even though certain parts of the parish church and possibly some less impressive buildings may pre-date the present structure. 1. The Heritage Project would like to express its gratitude to the owners for allowing this survey to take place.